Extruded shapes of engineering thermoplastics or their compound are used for bearings, sliding surfaces, bushings, or anywhere there is relative motion between contact parts. Usually, no additional lubrication is required. Resins that are often used include Fluoropolymers, Nylons, Olefins and Polyketones. To enhance properties, these and other resins are compounded with PTFE, Aramid fiber and Molybedenum Disulfide. The selection of the material to use is based on the pressure and velocity between the surfaces, the operating environment, and the nature of the mating surface. 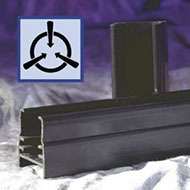 The use of an anti-friction extrusion is often an opportunity to combine parts. These materials generally require strict adherence to the rule of even wall thickness. 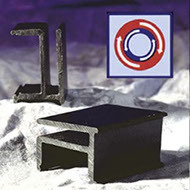 Parts made from engineering thermoplastics are often used in harsh environments: temperatures up to 300° C (575° F) and down to -60° C (-76° F); exposure to radiation from UV, gamma rays, X-rays and microwave; a full range of chemicals, organic and mineral including solvents, water and sea water. Materials for extreme temperature use include Fluoropolymers, Polyketone, Polysulfones, Nylon 11 and 12, as well as their compounds. Depending on the circumstances, many resins, alloys and compounds will give satisfactory service under radiation exposure. Fluoropolymers, Polyolefins, Polyketones and Nylons, as well as their compounds, are used in chemical resistance applications. Engineering thermoplastics, especially when compounded with reinforcing fibers and extruded into specially designed shapes, can provide the strength and stiffness of metals at much lighter weights. Most of the rigid engineering thermoplastics, especially when compounded with aramid, glass or graphite fibers, are used. PVC, ABS and Polystyrene are used for lowest cost. 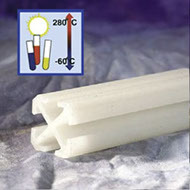 PPO, Nylon 66 and Polycarbonate are intermediate in cost and properties. Polysulfones, Polymides and Polyketones are used in the most demanding applications. All of the well recognized rules of mechanical design apply to engineering thermoplastics. Glass and graphite fiber reinforced materials become completely anisotropic when extruded and this must always be kept in mind. The avoidance of stress risers is vital. Applications combining anti-friction and /or static dissipation with strength are common. This is often a great opportunity to combine parts and simplify assembly with snap action. Thermoplastics vs. Metals: Depending on your application, sometimes metals will be appropriate for your design and sometimes plastics. Modern thermoplastics have made great strides in replicating many of the strengths of metals without their drawbacks. For example, many thermoplastics offer strength, rigidity and impact resistance that meet or exceed many metals, without the added weight. Many transportation applications have changed from metals to plastics for this reason alone. Another misconception about plastics is that they burn where metals don't. Although this is true of many plastics, there are flame retardant packages that can be added to thermoplastics that make them adhere to often stringent flame-smoke-toxicity requirements of modern aircraft and land vehicles such as rail cars. Many thermoplastics on their own, such as PEEK and Ultem, also offer high melt points, over 575° F. Combined with glass, carbon or Aramid reinforcements, structural integrity can be maintained while achieving static dissipation. Metals are naturally conductive without fillers, and generally are stronger and stiffer than even reinforced plastics. It usually costs less for tooling as well. Drawbacks can include higher weight, melt points that can be lower than some thermoplastics, and corrosion. Depending on your application, metal or thermoplastic can solve your design challenge. Let Certified's engineers discuss with you your specific project. Although we do not work with metals, we can advise whether or not plastic extrusion is the correct solution.If not, we'll tell you! Engineering thermoplastics are inherently excellent electrical insulators. However, their other properties of high strength, low weight, low friction and environmental resistance have given compounders incentive to develop alloys and additive packages that make these materials conductive enough to dissipate static. This conductivity is permanent, independent from humidity, and cannot be rubbed off. 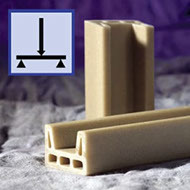 Virtually all engineering thermoplastics are used in static dissipation applications. The operating environment and mechanical requirements are the criteria for choice of material. Conductive fillers/reinforcements often used include conductive organics, carbon powder and graphite fiber. Stainless steel fiber and aluminum flake are used for even greater conductivity. Designing a structural part that is static dissipative almost always results in parts consolidation. Since each material behaves somewhat differently with each extruded shape, these designs must be approached cautiously. Since they are organic materials, most thermoplastics will burn. When they do, they can generate noxious fumes and smoke. However, the popularity of engineering thermoplastics in aircrafts, automobiles, and other forms of public transit has resulted in the development of new methods and materials which reduce these dangers. 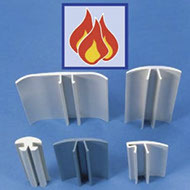 Resins such as Polysulfones and Polketones are extremely difficult to ignite and maintain combustion. There are additive packages, some non-halogenated, that can be added to resins that reduce the chance of ignition, cause flame extinction, and greatly reduce smoke and fume generation. Engineering thermoplastics can maintain their desirable mechanical, electrical and decorative properties, while also becoming fire resistant.